The issue of generational differences is in the DNA of brand, media and advertising people. You can see it in how, what and where they present and package their messages. Today, it’s all about Millennials (originally dubbed Generation Y) and how demanding, fickle and tech-driven many consider them to be. But scratch a bit further and we see a critical difference in the importance of different channels, with the loyalty of Millennials significantly more dependent on mobile banking than other generational cohorts. These are all table stakes across all consumers, regardless of age. If a bank doesn’t do well on these they generally have poor loyalty scores. Furthermore, the banks that do well among Millennials are also the same banks that do well (for the most part) among all age cohorts. This tells us that it’s not necessarily a generational phenomenon leading these banks to perform well among the cohorts, rather these banks know how to drive stronger loyalty overall. Traditionals live up to expectations: on all three measures Traditionals have far stronger relationships with their PFI than is the case for any of the other generations, followed by Boomers. This same pattern is largely reflected in how the generations rate various aspects of their banking relationships. 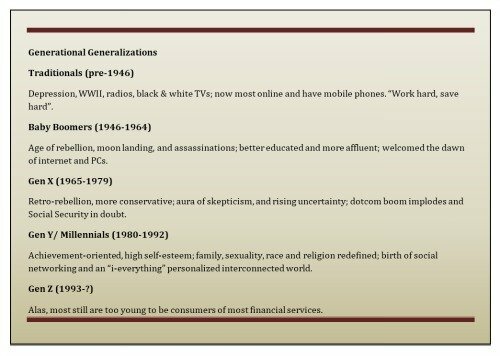 Whether it’s fees; willingness to lend and interest rates; problem resolution; product innovation; community involvement; corporate ethics; or the other attributes measured, the generations largely line up in the same order: Traditionals express the highest level of satisfaction, followed by Boomers, with Millennials and GenX recording the weakest scores and almost indistinguishable from each other. This trend also generally holds for how the generations evaluate the various channels they use, but here we see Millennials slightly more critical than GenX across all channels. Is it a question of trust? Millennials and GenX (62%/63%) are less likely than Boomers (72%) and Traditionals (81%) to describe their bank as “trustworthy.” This certainly either fuels or reinforces differences in customer loyalty and presents financial institutions with a challenge going forward, especially in light of the appeal of Bernie Sanders to younger voters combined with his rant against the banks. 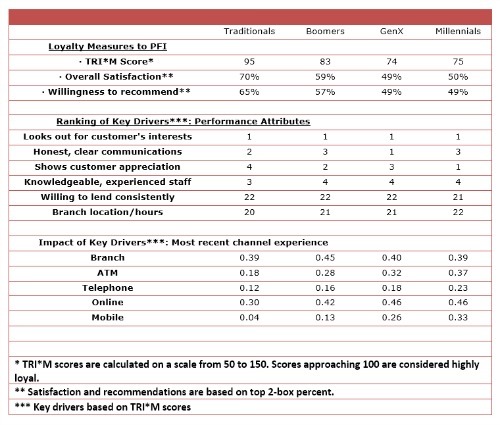 While the level of loyalty exhibits some clear differentiation across generations, the relative importance of a bank’s performance on various attributes (the “key drivers”) is essentially flat. Looking out for the customer’s interests; clear, honest communications; and expressing appreciation for customers pop as the top drivers across the board. On the flip side, convenient branch location and hours and willingness to lend stand near the bottom in importance for all generations. So while the generations manifest differences in terms of their degree of loyalty to their banks, the drivers of loyalty are essentially the same. This suggests that while the form andstyle of communications needs to be customized to resonate with different generations, thecontent of that messaging doesn’t necessarily need to be differentiated. Contrary to popular assumptions, the presumptions that Millennials are more motivated by social concerns are not borne out by the data: the extent to which a bank cares about the local community or is ethically and socially responsible, is no more important to securing the loyalty of Millennials than it is to GenX or Boomers. This might call into question notions that cause-related marketing is especially important in appealing to Millennials. Interestingly, these issues are even less important to Traditionals. Digging a little deeper, however, there are differences between generations in how their recent experiences with various distribution channels drives loyalty. In general, branch and online experiences have the greatest impact on loyalty, followed by ATM experiences, mobile banking and telephone banking. This pattern, however, varies by generation. The impact of the branch experience on loyalty is relatively consistent, popping slightly higher for Boomers, while the online banking experience holds relatively steady, but falls significantly for Traditionals. For ATM, mobile and telephone banking, however, the relative impact of satisfaction with each channel on loyalty is highest for Millennials and falls steadily with each older generation. The starkest differences are for mobile banking. Usage of mobile banking is highest among Millennials and falls with each preceding generation. More importantly, however, the impact of recent mobile banking experiences follows the same pattern and is a significant driver of loyalty for Millennials, is a little less important for Xers and falls to near trivial for Boomers and irrelevant for Traditionals. Millennials and GenX share more similarities than differences with regards to their banking experiences and loyalty to their primary banks, which simplify the challenge of trying to communicate to the two groups separately. In general, the drivers or motivators of loyalty are largely flat across the various generations, so banks need not worry that the content of these messages demand customization, although the form and style still need to be generationally appealing. Mobile appears to be the dividing line, a generational Rubicon: while smartphones are seemingly ubiquitous, the mobile banking experience is an important driver of loyalty for Millennials and, to a lesser extent, Xers, but is unimportant for the older generations. But do not think that the importance of technology to Millennials means that this group doesn’t care about the human touch when it comes to their banking needs: they still want experienced knowledgeable people available to help them when they need such support. Looking a little further ahead, the current protracted economic disorder threatens a structural shift that might be a defining characteristic of Millennials. Historically seen as economically attractive and a means of asset accumulation, for example, the housing crisis in the US may render home ownership inherently less appealing to Millennials. Many Millennials, moreover, suffered careerus interruptus before their careers even gained traction. A five or perhaps even 10 year disruption of the traditional 45-50 year working life might have significant consequences for the economic life stage progression of Millennials, their income trajectory and wealth accumulation, as well as their outlook for retirement. Trends such as these are likely to present significant challenges for financial services providers as Millennials move into middle age. Next up, Generation Z, the oldest of which are in their early twenties, the youngest not even in their teens, and most too young to be surveyed or have banking relationships in their own name.